Early American history is replete with legends about fast gunslingers. Famous gunfighters included men who were law men, outlaws, and surprisingly sometimes both. While history does not give concrete scientific evidence to prove who were the fastest draws of the Old West, one can conclude that the fastest quick draw shooters were the ones that survived the most gun battles. Here is a list of five men known to be some of the fastest quick draw gunslingers in the Old West. Ben Thompson is the story of a bad guy turned good but who eventually turned bad again. He was known for his quick temper and his even quicker pistol draw. After killing two men during one gunfight, Ben Thompson’s reputation turned notorious. Wanting to reverse the murderous outlaw image that he had rapidly acquired, he became a Marshall. However, the reputation stuck, and he was eventually gunned down as retaliation for his misdeeds. Wyatt Earp was also a famous lawman gunslinger, and the unruly towns in which he found himself forced him to further cultivate his quick-draw skills. Wyatt Earp had back up during many of his bloody encounters; his brothers Morgan and Virgil as well as his friend Doc Holliday were pretty fast shooters in their own rights. Killer Jim Miller was hanged in 1909 for his infamous gunslinging exploits but not before sending many to their graves early. He was known as an assassin that could be hired out by the highest bidder. Knowing his risky line of work, he ingeniously wore a primitive form of body armor in the form of a metal plate underneath his clothing to deflect bullets. His makeshift bullet proof vest did not help him when he was taken by an angry community mob and hanged. John Wesley Hardin was one of the most dangerous gunslingers in Old West history, and woe to the man who was fooled by his evangelical style name. He was the son of a Methodist preacher who became a violent murderer at an early age. By twenty five years of age, he had killed over forty people. His days of crime caught up with him, and he was sent to prison with a relatively light sentence of sixteen years. After being released from prison, he seemed truly on the road to reform as a student and practitioner of the law. However, the reputation that he had gained in his youth sadly would not let him live out his days in peace. He was eventually shot in the back in Texas. The old scriptural saying is true, “he who kills with the sword, must be killed with the sword.” Many of the quickest draw gunfighters of the Old West were simply murderers, and they ended up being killed by the same type of weapons they employed on others. 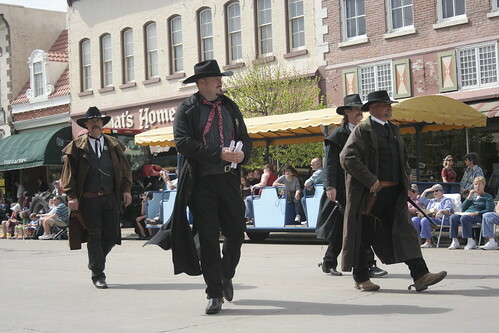 Other gunfighters were caught and hanged. Whether lawman or outlaw, it seems that none of these characters were able to live long and prosper. Reg Oliver is a gunsmith and guest author at Become Gunsmith, where he contributed to the online gunsmith training guide.